Stacy Horn » Blog Archive » Why oh Why Did I Ever Start This Dental Implant Process?? Why oh Why Did I Ever Start This Dental Implant Process?? I’m in Brookline, MA, in my hotel room, chilling out for a bit, before the dinner to honor my cousin. This will be an interesting dinner because my temporary teeth fell out on the way up. I stopped in a drugstore and bought that cement stuff that never really works, and right now my teeth are back in but crooked, and I can’t quite close my mouth all the way, and you just know what is going to happen in the middle of dinner. Should we take bets? I say it happens if and when I’m introduced to the most senior person at Dana Faber, or when I meet the only single man there my age. They will fall into a glass of water with a nice splash and a plunk noise, just like in the movies, for all to see. Actually, if life were like the movies, I’d end up marrying the cute guy who witnessed my supreme embarrassment. 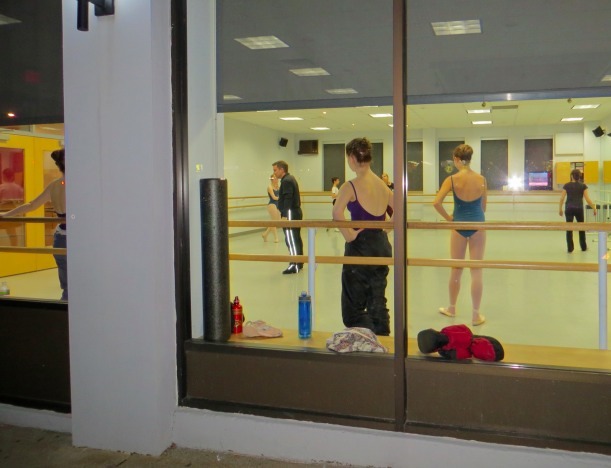 A ballet school we passed by while I looked for a place to buy a metrocard. I have to get up at the crack of dawn to take the subway to my bus and I’m terrified of missing it.